Fifty years after the end of the Civil War, the nation’s 9.8 million African Americans held a tenuous place in society. Ninety percent of African Americans lived in the South, most trapped in low-wage occupations, their daily lives shaped by restrictive “Jim Crow” laws and threats of violence. But the start of World War I in the summer of 1914 opened up new opportunities and changed American life and culture forever. “Recognizing the the significance of World War I is essential to developing a full understanding of modern African-American history and the struggle for black freedom,” argues Chad Williams, Associate Professor of African Studies at Brandeis University. While the United States wouldn’t enter the conflict until 1917, the war in Europe stimulated the U.S. economy almost from the start, setting off a 44-month long period of growth, particularly in manufacturing. At the same time, immigration from Europe fell sharply, reducing the white labor pool. Combined with a boll weevil infestation that devoured millions of dollars worth of cotton crops in 1915 and other factors, thousands of African Americans across the South decided to head North. This was the start of the “Great Migration,” of more than 7 million African-Americans over the next half-century. During the World War I period, an estimated 500,000 African Americans moved out of the South, most of them heading for the cities. Between 1910-1920, the African American population of New York City grew 66%; Chicago, 148%; Philadelphia, 500%; and Detroit, 611%. As in the South, they faced discrimination and segregation in both jobs and housing in their new homes. Women, in particular, were largely relegated to the same work as domestics and childcare workers as they had at home. In some cases, tension between whites and the newcomers turned violent, as in the deadly East St Louis riots of 1917. African American public opinion on America’s role in the war mirrored that of white Americans: first they didn’t want to get involved in a European conflict, the quickly changing course in late 1916. Most young African American men were ready and willing to prove their patriotism and their mettle. Over 1 million registered for the draft, of which 370,000 were selected for service, and more than 200,000 were shipped off to Europe. From the beginning, there were disparities in how African American servicemen were treated. They were drafted at a higher percentage. In 1917, local draft boards inducted 52% of black candidates and 32% of white candidates. 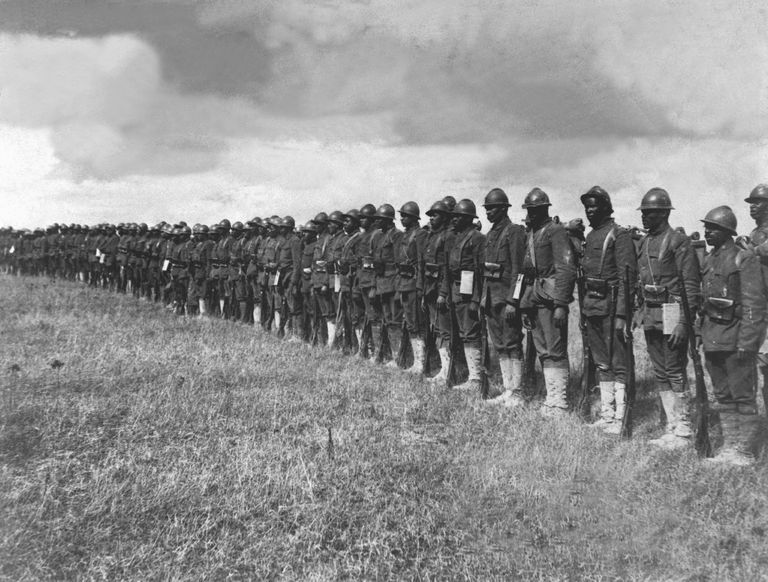 Despite a push by African American leaders for integrated units, black troops remained segregated, and the vast majority of these new soldiers were used for support and labor, rather than combat. While many young soldiers were probably disappointed to spend the war as truck drivers, stevedores, and laborers, their work was vital to the American effort. The War Department did agree to train 1,200 black officers at a special camp in Des Moines, Iowa and a total of 1,350 African American officers were commissioned during the War. In the face of public pressure, the Army created two all-black combat units, the 92nd and 93rd Divisions. The 92nd Division became mired in a racial politics and other white divisions spread rumors that damaged its reputation and limited its opportunities to fight. The 93rd, however, was put under French control and didn’t suffer the same indignities. They performed well on the battlefields, with the 369th—dubbed the “Harlem Hellfighters”— winning praise for their fierce resistance to the enemy. African American troops fought at Champagne-Marne, Meuse-Argonne, Belleau Woods, Chateau-Thierry, and other major operations. The 92nd and 93rd sustained over 5,000 casualties, including 1,000 soldiers killed in action. The 93rd included two Medal of Honor recipients, 75 Distinguished Service crosses, and 527 French “Croix du Guerre” medals. If African American soldiers expected white gratitude for their service, they were quickly disappointed. Combined with labor unrest and paranoia over Russian-style “Bolshevism,” the fear that black soldiers had been “radicalized” overseas contributed to the bloody “Red Summer” of 1919. Deadly race riots broke out in 26 cities across the country, killing hundred. At least 88 black men were lynched in 1919—11 of them newly-returned soldiers., some still in uniform. But World War I also inspired fresh resolve among African Americans to keeping working towards a racially-inclusive America that truly lived up to its claim to be the light of Democracy in the modern world. A new generation of leaders was born from the ideas and principles of their urban peers and exposure to France’s more equal view of race, and their work would help lay the groundwork for the Civil Rights movement later in the 20th Century.